Harold Boughton was born in 1910 in Gloucester. As a schoolboy, Harold displayed wonderful skill and phenomenal distance as a place kicker, and he accomplished some extraordinary performances for the Archdeacon School, who were the local champions and registered some prodigious scores whilst he was playing. On one occasion, appearing at centre three-quarter, he scored five tries and kicked 13 goals – some feat for a lad of 12! Indeed in 1923-24-25 the Archdeacon School, with Harold as their star player, were undefeated for three seasons, during which they registered 2,150 points against a mere 26. He had full confidence in his ability at that early age, an attribute which was strikingly apparent throughout his whole career. Representative honours came early in his career. Playing for Gloucestershire Schoolboys in their 12-3 victory over Devon in February 1924, he was reported to be “easily the most conspicuous player, his display being one of the outstanding features of the game”. He went on to win caps at full-back for the England schoolboys team, and was captain in 1925 when they gained a rare victory over the Welsh boys, by 6 points to 3 at Leicester. Indeed Leicester was a happy hunting ground for Harold that year – he was also in the Gloucester Boys team which went up there and defeated the youthful Tigers by 32 points to 5. By the time he was 16 years old, Harold had grown into a substantial young man, and made 17 appearances for the Gloucester A team, which lost only three games in the 1926-27 season. Harold contributed 19 tries and a conversion. Before the season was over, he was handed the opportunity to make his debut in senior football as a result of the illness of G Thomas, the regular City full-back. 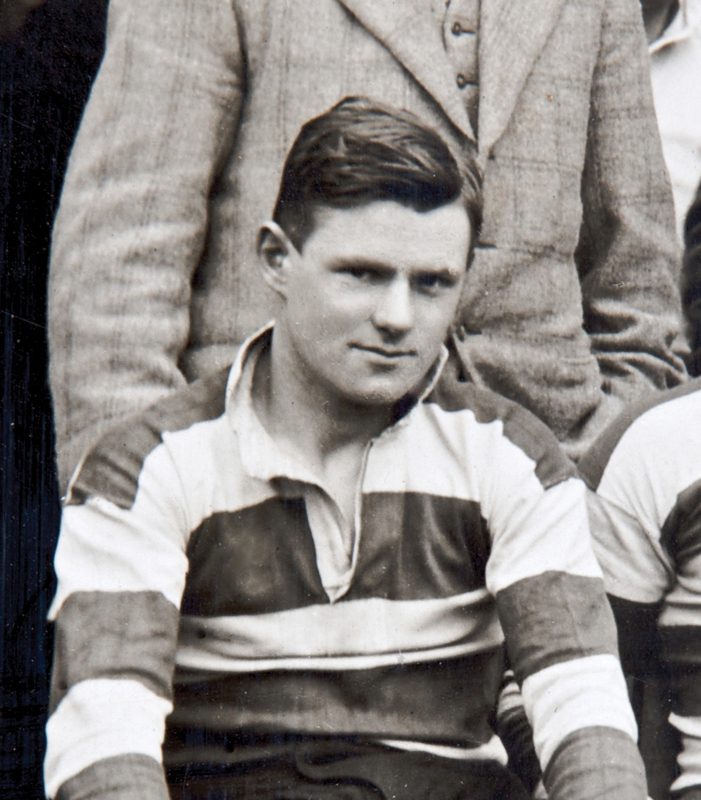 Harold’s excellent form continued through 1928-29, and his contribution in scoring reached new heights, 36 appearances producing 133 points from 42 conversions, 15 penalties, and one dropped goal. He made his debut for the County against Glamorgan at Cardiff on 10th October 1928, soon after his 18th birthday. He contributed four conversions in a 26-9 win, and played in his first County Championship game against Cornwall at Redruth on 1st December 1928, a hard fought 6-5 victory. He remained in the team against Somerset and Devon. 1929-30 was just as good with 124 points from 44 conversions, 11 penalties and a solitary try in the course of 32 appearances for his Club. Indeed this try, scored against Bath in a 3-3 draw at Kingsholm on 27th December 1929, was a collector’s item, since it proved to be the only one in his long career. He won four more caps for Gloucestershire, kicking points against Somerset and Cornwall, before making a decisive contribution with three penalties against Middlesex in the semi-final at Twickenham securing a 12-6 victory. The final against Lancashire was played at Blundellsands on 8th March 1930, and Harold kicked two conversions as Gloucestershire won their sixth Championship 13-7. Harold was selected to play in an England trial, kicking three conversions for the Whites v the Colours. 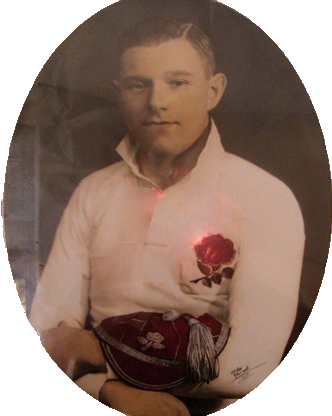 He was then selected for the Rest in the final trial at Twickenham on 21st December 1929, but England won 29-7, and he was not awarded an international cap, although he clearly remained in the selectors’ minds, and it appeared only a matter of time before he won international honours. In 1930-31, Harold was less available for Gloucester, because of representative commitments, and scored 61 points for from 15 conversions, nine penalties and a dropped goal. WB recorded that “Harold Boughton was not so consistently brilliant at full-back as last season, but he had many good days, and played all through the Championship matches for Gloucestershire, and was reserve in attendance for England at Murrayfield for the Calcutta Cup. The coveted cap has eluded the Gloucester custodian so far, but though old in experience, he is young in years, and perhaps next season?” Indeed, Harold won six further caps for Gloucestershire, as they retained their Championship title. In the final, they were perhaps fortunate to win a game in which they were outplayed for much of the match, but Harold provided a resolute last line of defence and converted both of his team’s tries as they squeezed home 10-9 against Warwickshire. In 1931-32, Harold played regularly and well for Gloucester, notching up 26 appearances, and scoring 73 points from 23 conversions and nine penalties. WB summarised his season: “Boughton, at full-back, had a few lapses, but on the whole well maintained his reputation as one of the soundest custodians in the country. He again appreciably helped the aggregate points with his successful goal-kicking, though not approaching his wonderful records of 1928-29 and 1929-30.” He played in the first County Championship match against Devon, but Gloucestershire lost heavily and Harold was dropped for the next game. Gloucestershire turned their season round and went on to retain their title, but without making any further use of Harold’s services. The England selectors also ignored him, and it seemed that his chance of international honours was gone. When Gloucestershire again lost their first Championship match to Devon, Harold was restored at full-back for the next fixture, and retained his place right through to the Championship final. In the semi-final he contributed a penalty goal in the narrow 10-9 victory over Hampshire at Boscombe. But there was disappointment in the final at Northampton, when East Midlands prevailed 10-0. Harold had a good season for his Club in 1934-35, contributing 134 points, made up of 48 conversions, ten penalties and two dropped goals, from 24 appearances. He remained in the County side to win a further four caps in 1934-35, but they failed to progress from the group stage. The England selectors continued to shun his claims, and selected six alternative full-backs during the trial matches, but none of them proved satisfactory. Nevertheless, when it came to the first international of the season against Wales on 19th January 1935, there was considerable surprise and astonishment when the selectors turned to Harold. WB held forth on the eve of Harold’s first England cap: “Harold Boughton’s selection for England against Wales, at Twickenham next Saturday, came as a big surprise to London press critics, but the failure of the three players tried out in the final trial paved the way for the entry of the Gloucester full-back into international football. It is a distinction thoroughly merited. The honour paid Boughton is rather belated. He has been in the front rank of custodians for the past five years, but always just failed to gain the coveted recognition. Now he has secured the favour of the selectors without being called upon to appear in the trials – a significant appreciation of his ability. So, Harold won his first England cap against Wales at Twickenham on 19th January 1935 in front of 70,000 spectators, a record crowd. Before kick-off, the teams were presented to the Duke of Kent. It turned out to be a triumph for Harold, who played well throughout before saving the game for England near the end. Many of those commentators who had been critical of his selection had to admit that he played a blinder. With ten minutes to go, England were three points down, when they were awarded a penalty, and WB described the tense situation: “the position was a favourable one, and when I saw Kendrew (the England captain) call up Boughton to take the vital shot for goal. I recalled many goals the Gloucester man had kicked from more acute angles. Boughton, in an interview, described the moment as the “worst in my life; the fact that the result of the match depended on my kick was rather frightening”. To me, Boughton appeared the coolest man on the ground, despite the tension, and he set about the preliminaries of placing the ball as casually as in a club match at Kingsholm, It was a fine goal, and the cheering which greeted the effort was terrific. The Gloucester man had something to be proud of in his first big test, and altogether it was a red letter day for the old Archdeacon schoolboy.” Harold had salvaged a 3-3 draw for his country. In the next match at Murrayfield, against Scotland, he did not meet with the same success with his kicking, but he fully maintained his reputation as a reliable and sound full-back. Harold played for Gloucestershire and Somerset against New Zealand at Bristol on 3rd October, which the All Blacks won comfortably 23-3. He remained a County player throughout their Championship campaign, but a narrow defeat 5-7 against Cornwall at Kingsholm on 14th December 1935 saw them lose the group, and proved to be Harold’s last game for Gloucestershire. Harold decided to take a break from rugby in 1936-37, and only played in nine matches, scoring 37 points, for the Club, who were left uncertain as to whether he was going to retire permanently. They therefore accepted the services of Grahame Parker as the regular full-back. Parker also took Harold’s place in the County side. In 1939-40, Gloucester arranged a series of matches in which Servicemen training in the district and local players combined under the leadership of Carpenter. For the second season the City continued on the same lines, with Harold Boughton in charge of the side, but lack of players eventually forced a cessation of club fixtures for the next four seasons. When rugby resumed after the war in the 1945-46 season, Harold, now aged 35, was elected captain, and being a bus driver by profession, when necessary he drove the team bus to away matches. He played in 29 matches and scored 121 points from 35 conversions and 17 penalties, and retired at the end of the season. However, he answered the call yet again, coming out of retirement on 12th October 1946, when Gloucester’s first choice and reserve full-backs were unable to travel. He kicked a conversion and a penalty, but it was not enough to prevent Gloucester going down 8-20 to Cardiff, and this proved to be his last appearance for the Club. His final record for the Club was 335 appearances and 1258 points, from one try, 400 conversions, 141 penalties and eight dropped goals. Harold died in July 1986 in Bristol. Hi – Harold was my great granddad. I too like hearing about him and do always speak about his achievements and so does my father Geoffrey, his grandson. Hazel was my dad’s mother; my father used to visit his granddad many years ago when he first joined the army. Nigel, you were only young, hope you will get in contact. Hi – my name is Craig Smith and Val Smith was (still is) my grandmother so Harold Boughton was my great grand father! Never met him but wish I did and very proud to know of his history and that he played for his country! All my family talk about it and mention that it’s our claim to fame. hi rachael im nigel im one of harolds son from his 2nd marriage im trying to find my dads family from his 1st marriage i met hazel val wendy at his funeral if you had met him you would have loved him. Sorry I stupidly omitted from my last post that Harold Boughton was the brother of my and my two brothers Grandfather Walter Boughton, Grace Phillips -nee Boughton – was Walter Boughton’s daughter. Harold was my grandad, my mum is his only living daughter from his first marriage, we too are proud of his achievements. I have two sons very keen Rugby fans and love hearing the stories and the history my grandad made playing for Gloucester and England. I wish I would have had the chance to meet him. Thanks for getting in touch with us, Rachel. Something that I’m not sure of – do you pronounce the family surname “Boughton” to rhyme with “doubt-on” or “Norton”? My dad played for both England & Gloucester rugby football club. I am so proud that he was my dad – I miss him so much.